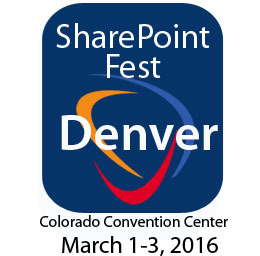 SharePoint Fest Denver declares LiveTiles as a gold sponsor of this annual technology conference which will take place March 1-3, 2016 at the Colorado Convention Center in Denver, Colorado. SharePoint Fest Denver to have LiveTiles, a global technology company, to sponsor this annual technology conference at the gold level. Conference delegates will hear from keynote speakers and attend breakout sessions. Over 70 sessions will be offered across multiple tracks, as well as an optional day of workshops preceding the conference. There will also be a networking reception held at the end of the first day of the conference. LiveTiles is a modern UI tool that functions like a presentation layer over Microsoft Azure and SharePoint. It's a powerful design canvas that joins the dots for business users, quickly and intuitively connecting them to the pieces of information they need to be productive. Once LiveTiles is installed into your environment, you can build fully-functioning sites or pages in just minutes and update elements like branding or layout in a few clicks. LiveTiles easy ‘drag and drop’ functionality excites users by offering a workplace technology experience that mirrors the convenience and touch-friendly UX they get from real-world interactions. LiveTiles out-of-the-box functionality includes dozens of pre-configured tiles, apps and icons. It readily connects to any Microsoft tool, and can seamlessly display content from your third party systems or other key data sources. SharePoint Fes t is in its sixth year. It offers a two-day conference (with an optional workshop day) that brings together SharePoint enthusiasts and practitioners, with many of the leading SharePoint experts and solution providers in the country.